Most people associate their Nespresso machine with coffee capsules, and generally espresso sized beverages (lets not forget George Clooney). However, did you know you can utilise your Nespresso machine in so many more ways, you’ll be left thinking “why hasn’t someone told me this sooner!”. From making beverages you may have previously thought impossible, to saving money, read on for our roundup of top 5 ways to get more from your machine. 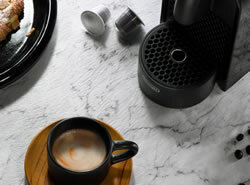 For those of you who aren’t that keen on coffee, but want to use that fancy new machine that sits oh so proudly on your kitchen work surface, look a little harder and you will see you can make other types of drinks like hot chocolate and milkshakes using your Nespresso machine! There are number of products on todays market. Ranging from a plain and simple Nespresso hot chocolates (compatibles), to multiple flavours including caramel, mint & hazelnut – we are hoping a gingerbread one will arrive before Christmas! 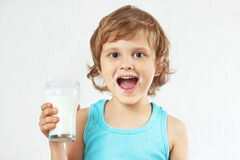 Simply pop the pod into your machine and extract as normal – filling up with milk. Tell everyone about this one because we are! We all know that Nespresso pods aren’t the cheapest, especially when you take into account postage charges, but fear not – there are so many choices now available to get Nespresso compatible pods & capsules at a discount to Nespresso’s own. Not only can you save money on the pods themselves, you can save lots on postage too! When we buy an appliance for our homes we want to make sure we make the most of it, especially those that cost a few extra of your hard earned pounds! M ost would agree that the Nespresso range is predominantly aimed at an older generation, they seem to sell it as something for mum and dad to enjoy while the kids are getting ready for school maybe, or something for the workaholic to enjoy while working tirelessly at a desk – you get the gist. A company in Australia have created the worlds first Nespresso milkshake pods called Podista Poddies. They currently come in three sugar free flavours – Chocolate, Strawberry and Honeycomb. From the feedback we have seen, they taste incredible and are just perfect for making your Nespresso machine an appliance for the whole family. Don’t worry though, they may be advertised as children’s milkshakes but there is no reason why us adults can’t indulge too! “How” we hear you ask. 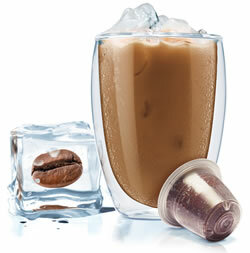 Well quite simple really… extract your coffee pods over ice and fill up with cold milk! There are even Nespresso compatible pods available specifically designed to make iced coffees HERE. With summer just around the corner get stocked up! We always assume our Nespresso machine can only help us make a beverage, well we say get a little bit more creative! – don’t be afraid of trying new ideas. As we already mentioned, with all these different flavours we couldn’t help but add chocolate to our porridge. That’s it – whether you were looking to save your money on your pods, or finding out that all these extra flavours now exist we hope you enjoyed our post. *** To find compatible pods price we looked at three retailers, mugpods, cafepod and gourmesso. Prices stated on each website as of 17/04/16 – although we have made every effort to ensure prices are accurate they are indactive only – we recommend you visit retailer websites and compare for yourself. Nespresso® is a registered trade mark of Societe Des Produits Nestle SA and is not related to Mugpods. Most people associate their Nespresso machine with coffee capsules, and generally espresso sized beverages. However, did you know you can utilise your Nespresso machine in so many more ways.